Puerto Rico is our new favorite island for great golf, star encounters, eco adventures and of course the beaches. The Gran Melia is an elegant seaside resort in a natural reserve. Perfect for couples, singles or the entire family, it is close to all activities and adjacent to the Trump International Golf Club, where the Puerto Rico Open is held. Comical Chi Chi Rodriquez is the ambassador for the PGA event and all of Puerto Rico. Competing in the tournament with the youngsters, he said he felt like “a roach in a chicken dance”. The St. Regis is Bahia’s integrated resort sharing the coast with Oscar de La Hoya’s pad. Starting at $1500 per night, you can stay on this pristine beach, served by not one, but two personal butlers to press clothes and mix mojitos. The highly rated courses of Rio Mar provide challenging, yet fair designs. Greg Norman’s River Course captures the mountainous terrain of the foothills with the river and friendly iguanas crossing narrow fairways. Tom and George Fazio’s Ocean Course is Floridian style with gentle sea breezes and one great par 3 along the ocean waves. El Conquistador is a palace of amenities, perched upon a hill overlooking the Arthur Hills designed roller coaster course. Through valleys and hilltops with 200 feet elevation changes, each fairway follows the contour of the jungle forest with sporadic views of the sea and Palomino Island. 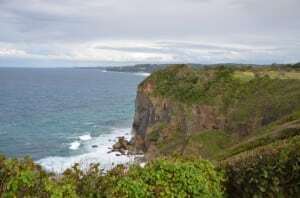 Roughly the size of Connecticut, Puerto Rico has over 20 golf courses but not with the ocean views that the Pasarell brothers of tennis fame, imagined. So Stanley, Charlie and partners, after 18 years in the making, will open Royal Isabela this summer. Stanley and his dog Dunas, honored us with a preview of this dramatic course, an ocean golf experience of a lifetime. Located on the cliffs of Isabela, this 7600 yard layout will simply take your breath away. Panoramic views 300 feet above the roaring ocean waves and native landscaping deliver golf with unbridled fury. The tropical Scottish link style treasure with a rating of 80.3 and 155 slope will be a bucket list course for the best of golfers. If the views don’t get you, the course will. For island nightlife adventure, head to the casinos or enjoy music from local salsa bands to Ricky Martin. Great chefs transform fresh seafood and fruits into exquisite cuisine. The brilliant Belt of Orion illuminates the night sky while Bio Bay delivers water luminescence in Laguna Grande. A night time kayak journey among the mangroves is a real life Disney thrill where millions of microorganisms flash florescent when brushed through the water. As for more of the human star encounters, Chris Tidland joined us for breakfast before shooting a record round to lead the tournament while John Daly’s son played ball on the beach. Among other pros, Aquaman stopped for a photo, actor Amaury Nolasco Garrido gave a hug before lunch, culminating with Miss Universe joining the dinner soiree, (not to name drop or anything).